Our range of products include brass lpg jets male to female, brass high pressure burner jets, brass lpg jet with latest blister pack, brass lpg jets and bras lpg jet male to male. 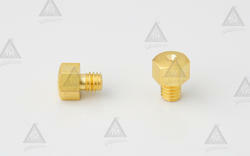 Our infrastructure is empowered with an advanced in-house unit, that back us to manufacture and export an exclusive range of Brass Assembly Burner Jets. The jets are used to fit on high pressure burners directly. 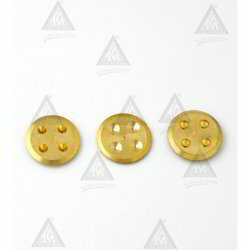 We manufacture the jets, with the help of our expert manpower using only best quality brass. 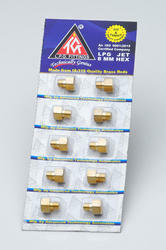 Offered at the market leading prices, our Brass Assembly Burner Jets are available in different sizes and finishing. Use : These Jets are directly fitted in high pressure Burners. It Transfers the flow of gas in to blue shaped flame as per Burner Head. 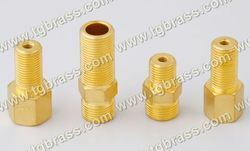 Our new Brass LPG jet With latest blister packing has an extraordinary quality standards with high accuracy of its drill size, having IS-319 Grade Brass Extruded material, Maximum wall thickness of calibrated orifice and many more. This new Blister pack sheet is having advanced quality packing such as medicine tablet packing and highly sticky plastic layer which holds the jets perfectly and all these are being produce at our state of art manufacturing unit by totally in house process of manufacturing.